1. La Muɔmi – Tying the La String. When the child is named, it is then that the child is accepted as a member of the house. This would be done during the outdoing ceremony. In Krobo culture the name is given and sealed during what is called the La Muɔmi. 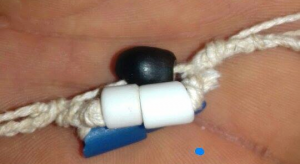 Tovi (Black bead) This tells the child that there is evil in society and it should avoid and not become part of it. Nyoli (White Bead) This tells the child that there is light and good in society and the child should reflect that. When a man has a child with a woman and is not married to the woman, the children belong to the woman. The child would be named according to the womans family and the La string would be tied by the family – sealing the ownership. If the man then decides he wants to take ownership of the children, he has to cut the seal put on by the womans family during the La Muɔmi performed by them. This is done through the La Pomi ceremony and will then allow the man to claim and rename the children according to his line. This ceremony takes place in the woman’s house and the mans family have to bring a castrated sheep and a bottle of alcohol (its usually schnapps) to the house of the woman. The sheep is slaughtered and one of the legs is given to the husband in appreciation.